As the Chinese Economy continues to grow, so does the need for online corporate learning solutions in China. In 2015, China Daily reported that nearly half of non-multinational companies in China said they used English at work. With more Chinese companies using business English in their daily operations, the need for language training- which is suitable for on-the-go, modern-day learners- is rising, and the Human Resources Excellence Centre of China recognizes this. The HREC, China’s largest and most influential network for HR professionals, recognizes excellence in HR solutions throughout China. Each year, awards in several categories are announced. One branch of the award series is the Value Award, and it is aimed at showcasing excellence in corporate skills development, such as language learning. During the judging process, several factors, including public service adherence, excellence, fairness and corporate responsibility are taken into consideration. The Value Award series is a widely recognized and well-established influence that carries high brand credibility in China’s human resources field. Award recipients are determined by both the information submitted by suppliers and feedback from end users. During the selection process, HREC invites nearly 500 L&D managers to participate in choosing candidates with criteria such as market visibility, market share, brand recommendation and other dimensions in mind. This year, for the second consecutive time, Speexx has won the Value Award Learning and Development Solution Provider in the category of Corporate Language Training Solution Provider. 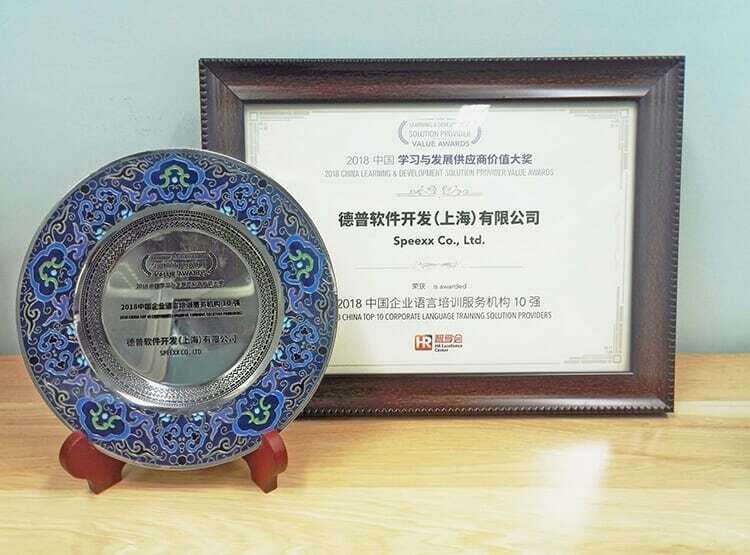 The award ceremony took place in Shanghai on 10 July, 2018 and the award was accepted by Jie Lie, PR & Marketing Manager Speexx China, on behalf of Speexx China. ‘’This award is a great testament of Speexx learning solutions and our great quality of service, as well as the inspiration for our future development’’ says Jie. More than 8 million users globally within 1,500 organizations use Speexx to learn languages smarter and deliver faster results. Since 2011, Speexx has taken on the challenge of growing E-learning excellence in China and now has over 140,000 Chinese users training their foreign language skills.